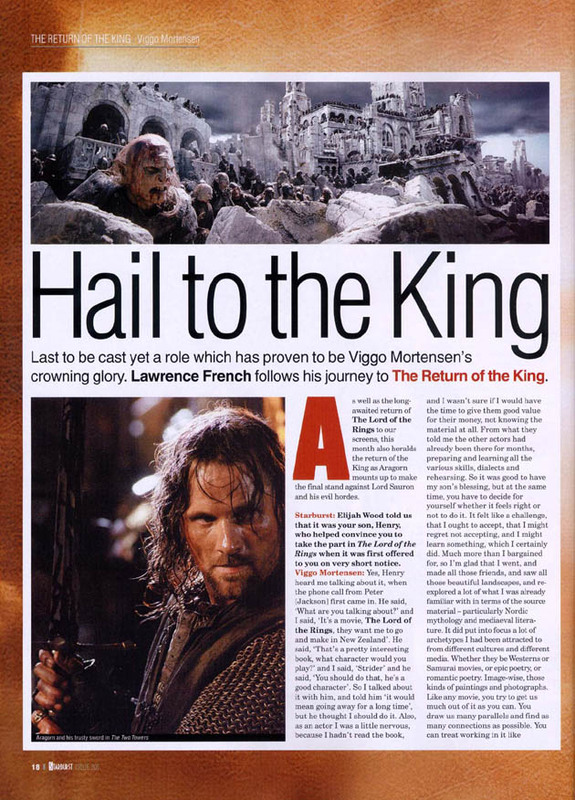 As well as the long-awaited return of The Lord of the Rings to our screens, this month also heralds the return of the King as Aragorn mounts up to make the final stand against Lord Sauron and his evil hordes. Elijah Wood told us that it was your son, Henry, who helped convince you to take the part in The Lord of the Rings when it was first offered to you on very short notice. 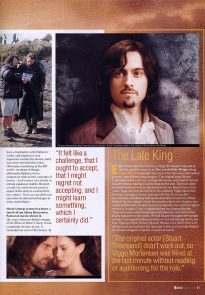 Yes, Henry heard me talking about it, when the phone call from Peter (Jackson) first came in. He said, ‘What are you talking about?’ and I said, ‘It’s a movie, The Lord of the Rings, they want me to go and make in New Zealand.’ He said, ‘That’s a pretty interesting book, what character would you play?’ and I said, ‘Strider’ and he said, ‘You should do that, he’s a good character’. So I talked about it with him, and told him ‘it would mean going away for a long time’, but he thought I should do it. Also, as an actor I was a little nervous, because I hadn’t read the book, and I wasn’t sure if I would have the time to give them good value for their money, not knowing the material at all. From what they had told me the other actors had already been there for months, preparing and learning all the various skills, dialects and rehearsing. So it was good to have my son’s blessing, but at the same time, you have to decide for yourself whether it feels right or not to do it. It felt like a challenge, that I ought to accept, that I might regret not accepting, and I might learn something, which I certainly did. Much more than I bargained for, so I’m glad that I went, and made all those friends, and saw all those beautiful landscapes, and re-explored a lot of what I was already familiar with in terms of the source material – particularly Nordic mythology and mediaeval literature. It did put into focus a lot of archetypes I had been attracted to from different cultures and different media. Whether they be Westerns or Samurai movies, or epic poetry, or romantic poetry. Image-wise, those kinds of paintings and photographs. Like any movie, you try to get as much out of it as you can. You draw as many parallels and find as many connections as possible. You can treat working in it like comparative mythology. or you can treat it like a job, where you’re supposed to memorize your lines, show up on time and do your thing, and walk away and not think any more about it. Either way, you can do a good job. The director takes what you’ve done and uses as his raw material, along with everything else and makes his movie. But for me, I like to explore and see where it will take you, and it took all of us lots of places that we didn’t expect. Mentally, emotionally and physically, too. It felt like a challenge, that I ought to accept, that I might regret not accepting, and I might learn something, which I certainly did. Of course, you are mining a very rich vein with Tolkien. It’s not a typical blockbuster movie, but more on a par with Shakespeare. Yes, and in this genre of the heroic journey – the quest myth – whether it be of an individual, or as in this case, of a group, it’s a story that has been told countless times over the millennia. Lord of the Rings is the same basic story that has been told thousands of times before. And not just in Europe. The same story has been told in Asia, Japan and by Native Americans. I don’t think there isn’t a place in the world that doesn’t understand this story. I know the movie company was initially worried that Japan didn’t have a familiarity with Tolkien’s books, and Japan is a very important market for movies, but I was never worried about that. Obviously, everything in the Elf world – in terms of design, philosophy, fighting styles, connection with nature, concepts of beauty – it all relates very closely to certain Japanese models. But just overall, the whole heroic journey aspect of the story is a natural for any culture. There are parallels you can make to cultural archetypes in many mythologies. Helm’s Deep seemed to have a touch of an Akira Kurosawa Samurai movie about it. Oh, yeah, when we did the charge of the Elves at Helm’s Deep, it was completely obvious to me, it reminded me a lot of Kurosawa. In fact, I wanted to use Elvish commands. Using that language, and some of those fighting styles, made it feel a little like a Samurai movie. It was a hodgepodge of different fighting styles, and total mayhem. I think you’ll get that feeling on an even greater scale in Return of the King. It’s hard to believe, after Helm’s Deep, but Pelennor Fields is really going to be an incredible spectacle. You were talking about how hard it was to do Helm’s Deep, shooting for four months at night-time, so it must have been a big relief that the Pelennor Fields battle takes place during the day. Yes, to have hundreds of horses charging, and having stunt-men being knocked over under them at night would have been even more dangerous than what we did at Helm’s Deep – which was already a very dangerous undertaking. I understand you broke two toes and a tooth during the fight scenes. Yes, every actor who was involved with fight scenes got hurt, in one way or another. You got stabbed, or smashed-up. It sort of went with the territory. But as in so many areas, you were swept along in the river of the story to such a degree, that you were able to put up with, physically, mentally and emotionally, a lot more than you were accustomed to. A human being can be quite a resilient creature. When people are put to the test and engaged in something, they will go well past what they thought were the limits of their endurance. And all of us, certainly did that. It wasn’t just the length of time, but it was the concentration of work, in each hour of each day – which always involved overtime. Out of that, bonds formed between the cast and crew members that will last our lifetimes. Every actor who was involved with fight scenes got hurt, in one way or another. You got stabbed, or smashed-up. It sort of went with the territory. With all that overtime I’m surprised the crew never revolted. Well, the regulations weren’t to their advantage, but as a whole team, no matter how frustrated or exhausted we got, everybody just proceeded as best they could until the end. It was definitely a labour of love. And sometimes it was quite annoying, because you couldn’t even catch your breath. You were like the walking dead. For the last six months that I was there, everybody was just completely exhausted, at all times. But everybody was in the same boat. 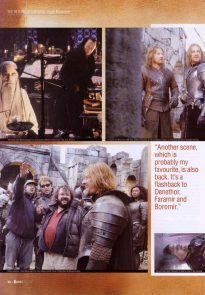 And even on the last few days of shooting, you’d still see Lord of the Rings paperbacks lying around, not just the cast, but the crew members, too. One felt it was a unique undertaking at all times, regardless of how chaotic and unmanageable any given day became, which was often the case. It was just barely under control a lot of times. It was a very ambitious project that seemed to become even more ambitious in its scope and aspirations as Peter kept brainstorming and coming up with new ideas. One felt it was a unique undertaking at all times, regardless of how chaotic and unmanageable any given day became, which was often the case. The effects supervisors were telling me how Peter likes to keep adding on work, which makes their job much more difficult. Oh yeah, I’m sure they’ll go right to the bitter end. I’m sure he’ll work them right into the ground. It’s the home stretch now, and everyone knows that, so everyone is willing to do that extra bit. Peter’s enthusiasm keeps everybody going, but it doesn’t feel like the movie is ever going to stop, and it certainly hasn’t for Peter. 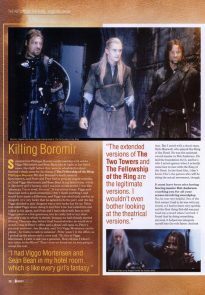 But since I started, I’ve always had the character in mind, and I’ve had to keep the part of me which was engaged physically and mentally with Aragorn, simmering. Due to the length of the shoot, it was like being in a repertory company; how familiar we all got with each other, and how familiar the actors got with their roles. I understand you bought Brego, the horse you used in The Lord of the Rings? Another scene, which is probably my favourite, is also back. It’s a flashback to Denethor, Faramir and Boromir. It’s interesting, because like James Stewart, who used the same horse in all his Westerns, you can use Brego again if you should ever do a Western. Of course, the whole subplot of Aragorn freeing Brego into the wild, got cut out of The Two Towers. Yes, but it’s back in the extended edition DVD. I’m very happy about that. Another scene, which is probably my favourite, is also back. It’s a flashback to Denethor, Faramir and Boromir. You learn so much more about Faramir and about why he does the things he does in The Two Towers. And you meet Denethor, so it sets him up and you get to see what he’s like before you see him in The Return of the King. It explains the relationships a lot more. Barrie Osborne told us it was your idea to add the scene in the extended cut of The Fellowship of the Ring where you visit your mother’s grave in Rivendell. I guess it was—I can’t remember now. A lot of little touches were added by everybody. Like the song about Beren and the Lady of Lothlorien that I sing that Frodo hears. In quick fashion that scene does a lot. It builds a connection with Arwen and the Elves, before you even see them, and it also shows that Frodo understands something of the Elfish language and that he has a curiosity and an intelligence. 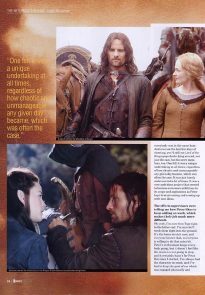 It says as much about Frodo and Arwen, as it does about Aragorn. But mostly it does something for the audience. All those little touches Peter came up with for the characters in the extended version, allowed the characters to show their full rein. I just hope they show them in a movie theatre. New Line is planning to show the first two extended cuts versions in cinemas for a one-week engagement before the opening of The Return of the King. That would be nice. To me, the extended versions of The Two Towers and The Fellowship of the Ring are the legitimate versions. If I were to watch them, I wouldn’t even bother looking at the theatrical versions, because the extended versions are a more complete telling of the story. Did you work with a stuntman on set for your scenes with the King of the Dead? Yes, although a lot of that will be done in CGI. The Army of the Dead, and all that, so it was a case where we had to use our imagination. But I acted with a stuntman, Kirk Maxwell, who played the King of the Dead. He was the assistant sword-master to Bob Anderson. He laid the foundation for it, and he’s who I acted against when I actually come face to face with the King of the Dead. In the final film, I don’t know if he’s the person who will be doing the actual movement, though. The extended versions of The Two Towers and The Fellowship of the Ring are the legitimate versions. I wouldn’t even bother looking at the theatrical versions. It must have been nice having fencing master Bob Anderson coaching you for all your scenes involving swordplay. Yes, he was very helpful. One of the first scenes I had to do was with my sword, so I had to learn very quickly, and the first thing Bob did was just hand me a sword when I arrived. I found that by doing something physical, it helped me integrate myself into the role faster. And not just the sword-fighting scenes, but the whole physicality of the part, in general. 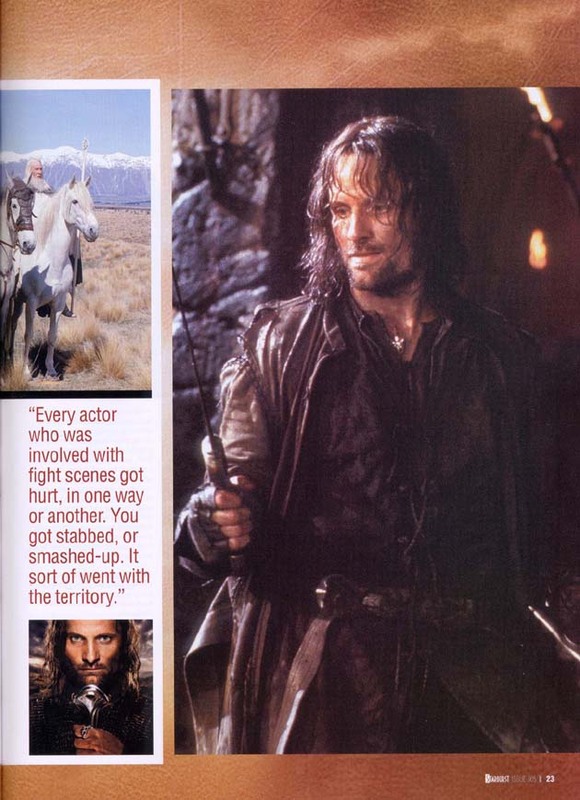 My baptism by fire in playing Aragorn was probably a good way to begin, because I was able to get some feeling for his movement and physical language before I ever uttered a single line of dialogue. So much of what I did in all three movies was non-verbal. How you get to know Aragorn is really through his gestures and reactions, much more than, say, Gandalf or Frodo, who are both much more verbal. Yes, Aragorn is more like a Sergio Leone Western hero, and of course Peter Jackson likes to do extreme close-up shots right into the actor’s faces. Did that bother you at all? No. I find if I’m involved in the scene I’m doing, it doesn’t matter to me if the camera is two inches away, or twenty feet away. You’re still trying to play the scene and trying to figure out, from take to take, how you can improve it. 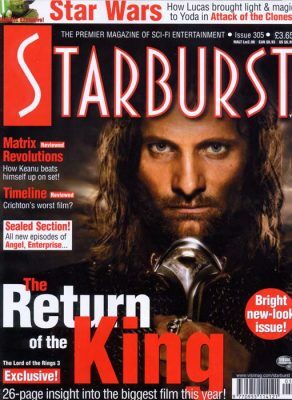 Elijah Wood tells Starburst how Viggo Mortensen was cast at the last possible moment in The Lord of the Rings trilogy. 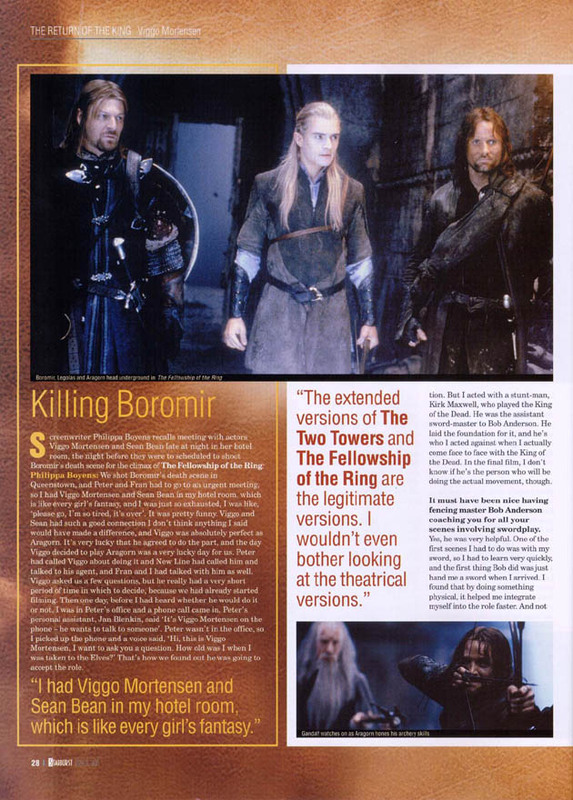 Elijah Wood: Originally, there were a few slip-ups in the casting process – one of them being Aragorn. The original actor [Stuart Townsend] didn’t work out, so Viggo Mortensen was hired at the last minute without reading or auditioning for the role. They just called him and asked him to do it, and based on his son Henry’s love of the books, Viggo decided that he’d do it. So, suddenly Viggo was in New Zealand, training on horses, training with Bob Anderson, the swordmaster, and filming with us five days after he arrived in New Zealand. 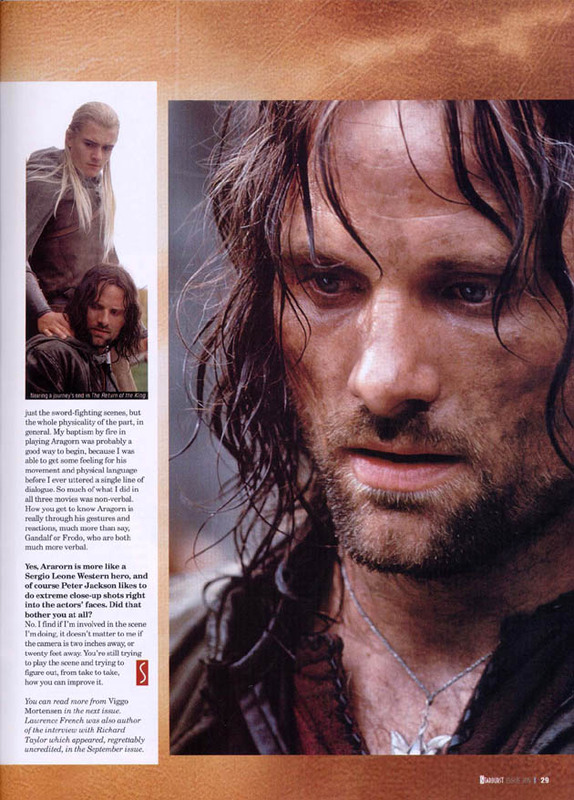 In that regard, I think his transformation into Aragorn was nearly unbelievable, because he wasn’t originally cast, and he was so perfect as Aragorn. I can’t imagine anyone else playing the role. There were quite a few fortuitous events like that, that led to what finally appeared on the screen. 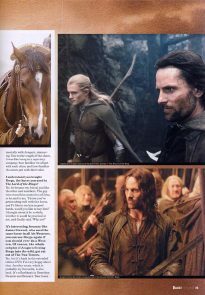 We had all gone through a two-month period of training and rehearsal before we started filming, and by the time Viggo got there, we were already filming, so he didn’t have a lot of time to get his head into the character, which is not an easy thing to do, because Aragorn is a pretty complex character. The original actor [Stuart Townsend] didn’t work out, so Viggo Mortensen was hired at the last minute without reading or auditioning for the role. Producer Barrie M Osborne explains how Viggo Mortensen became an inspiration for his fellow actors during the shooting of The Lord of the Rings. 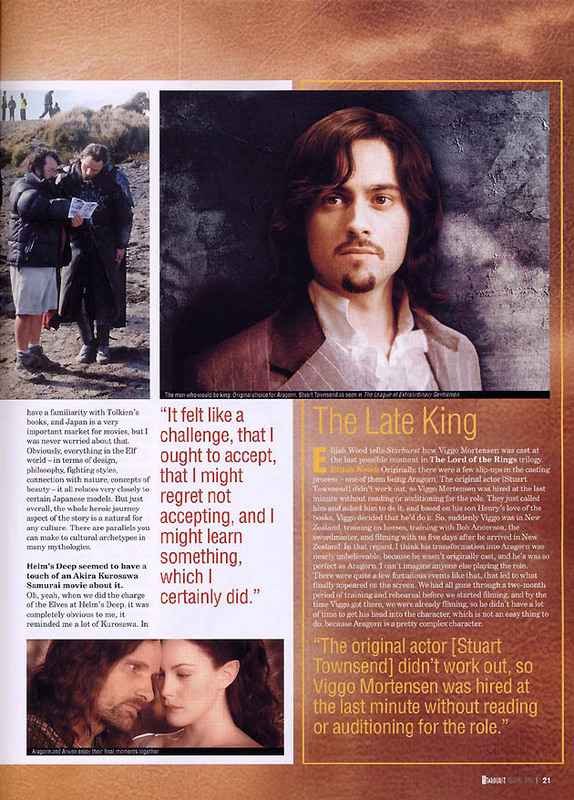 Barrie M Osborne: Every choice Peter made for the cast has been just about perfect. Ian Holm to play Bilbo – I couldn’t think of anyone better for that role. Elijah Wood as Frodo. 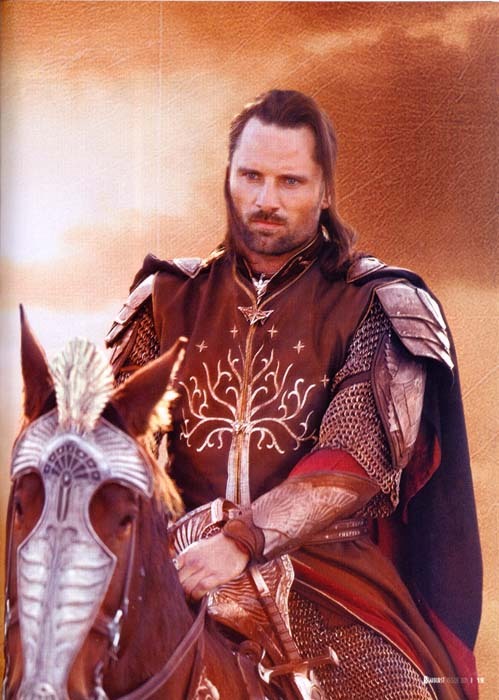 And Aragorn was very fortuitous, because Viggo Mortensen came in at the last minute. John Rhys-Davies accurately pointed out to me that in a large ensemble cast, one or two actors end up becoming the leaders. 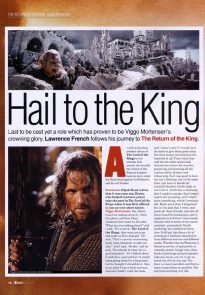 On The Lord of the Rings, Viggo became that leader, a role model for the younger actors. And thank our lucky stars, because he is a totally dedicated, professional actor. During one sword-fight, Viggo had a tooth knocked out, and actually asked if he could continue the scene by super-gluing his tooth back on! He was so involved, he became someone the younger actors all wanted to emulate. So instead of rivalries between different cast members, we had a really organic situation, where a fellowship evolved involving the entire cast. That was one of the benefits of shooting the three films all at once: the camaraderie that developed by working together for such a long period of time. During one sword-fight, Viggo had a tooth knocked out, and actually asked if he could continue the scene by super-gluing his tooth back on! 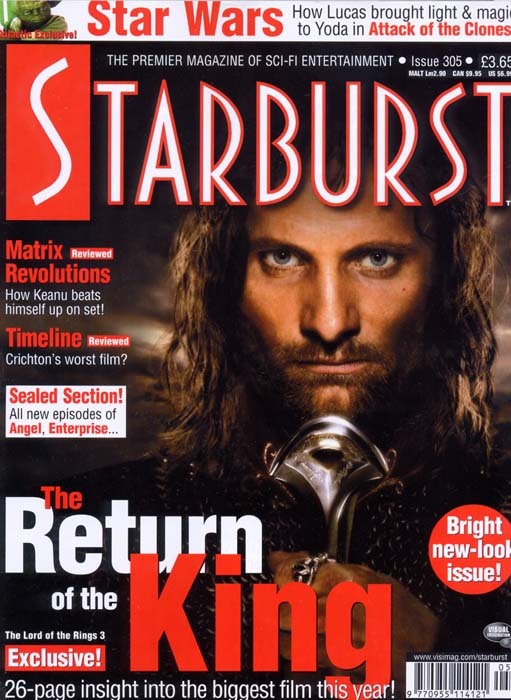 Effects arts director Christian Rivers tells Starburst how Viggo Mortensen brought ideas for Aragorn’s props that Weta workshop made for his role as Aragorn in The Return of the King. 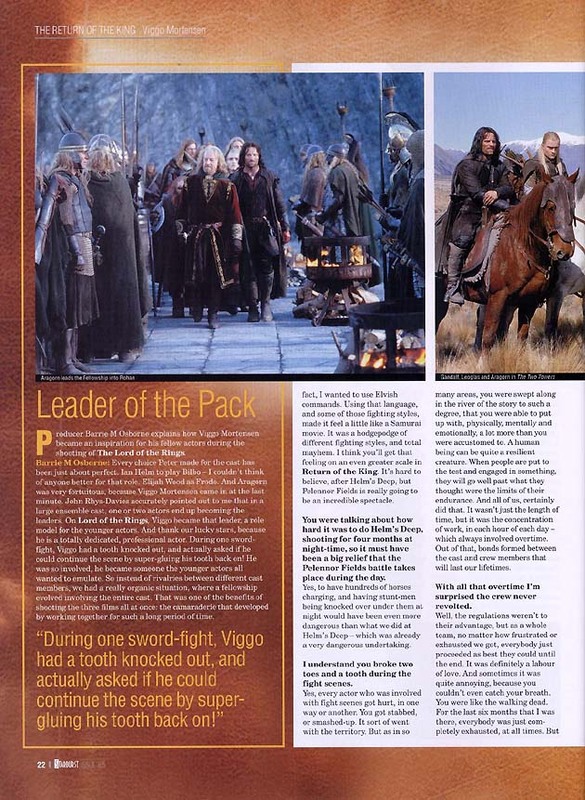 Christian Rivers: When Viggo came in, he fitted the bill perfectly as Aragorn, and he also had great ideas. When he picks up the Hobbits in the first film, he has this small hunting bow and arrows, like someone who lived in the wild would have. But that’s not something we had ever thought about designing for Strider. That was Viggo’s idea. He came in and started talking about the character, and said, ‘If I live out in the wild, I’d have a small hunting bow for catching food. It would never be a big deal, maybe you’d just see it while I’m making a campfire.’ We said, ‘Yes that makes complete sense, we didn’t think of that, so let’s make you a bow’. It was always great to have those kinds of discussions with the actors. When Viggo came in, he fitted the bill perfectly as Aragorn, and he also had great ideas. 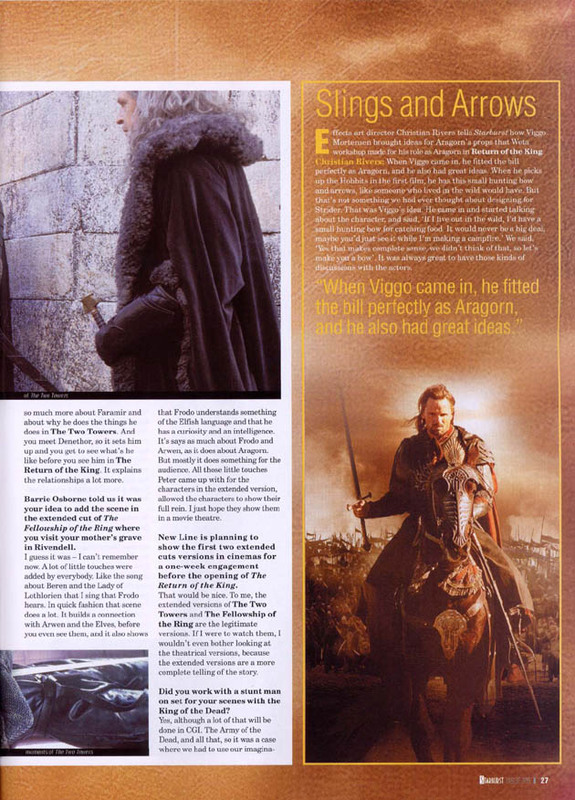 Screenwriter Philippa Boyens recalls meeting with actors Viggo Mortensen and Sean Bean late at night in her hotel room, the night before they were scheduled to shoot Boromir’s death scene for the climax of The Fellowship of the Ring. Philippa Boyens: We shot Boromir’s death scene in Queenstown, and Peter and Fran had to go to an urgent meeting, so I had Viggo Mortensen and Sean Bean in my hotel room, which is like every girl’s fantasy, and I was just so exhausted, I was like, ‘please go, I’m so tired, it’s over’. It was pretty funny. 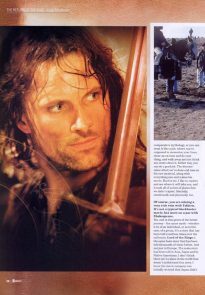 Viggo and Sean had such a good connection I don’t think anything I said would have made a difference, and Viggo was absolutely perfect as Aragorn. It’s very lucky that he agreed to do the part, and the day Viggo decided to play Aragorn was a very lucky day for us. 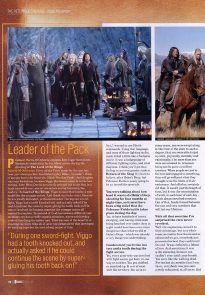 Peter had called Viggo about doing it and New Line had called him and talked to his agent, and Fran and I had talked with him as well. Viggo asked us a few questions, but he really had a very short period of time in which to decide, because we had already started filming. Then one day, before I had heard whether he would do it or not, I was in Peter’s office and a phone call came in. 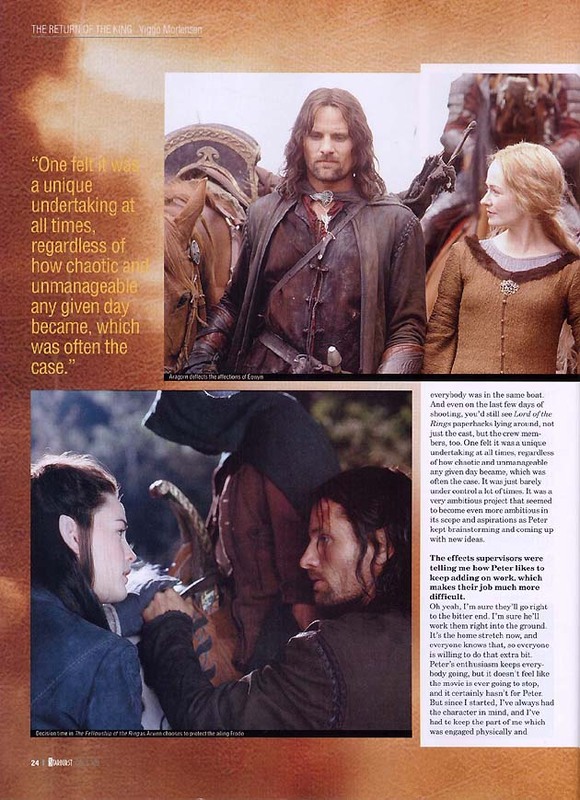 Peter’s personal assistant, Jan Blenkin, said, ‘It’s Viggo Mortensen on the phone – he wants to talk to someone’. Peter wasn’t in the office, so I picked up the phone and a voice said, ‘Hi, this is Viggo Mortensen, I want to ask you a question. How old was I when I was taken to the Elves?’ That’s how we found out he was going to accept the role. I had Viggo Mortensen and Sean Bean in my hotel room, which is like every girl’s fantasy. Scans posted by sachie in 2004. Sadly, her site is no longer active. Published December 2003 in Starburst #305.